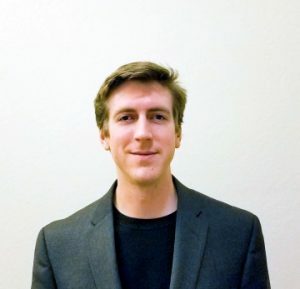 As fires ravage California, destroying thousands of homes and buildings, a much greater number of people are being directly impacted by the horrific air pollution currently covering much of the state. This air pollution is not nearly as deadly as the fires themselves – a best estimate is that only one person will be killed by it – but that doesn’t mean that there isn’t a real detrimental impact, especially for children, the elderly, and everyone with asthma. 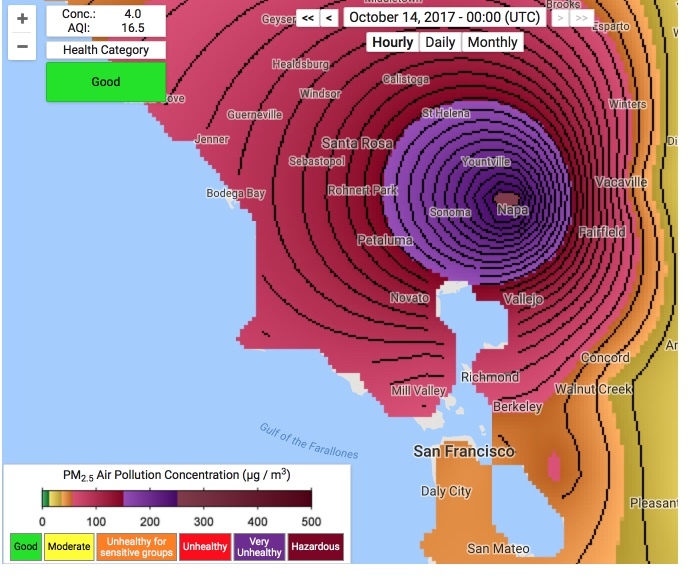 Current levels of outdoor air pollution for most of the Bay Area are considered “unhealthy”. Put another way, spending a day outside in this pollution has a similar impact on your health as smoking five cigarettes. Staying indoors can help, especially if you have a high-quality air filter running full blast. Other coping mechanisms include wearing a facemask (be sure to get one that filters out PM 2.5) and restricting outdoor activity. Distance from the immediate fire area is no protection. Pollution levels very widely, based on wind conditions. 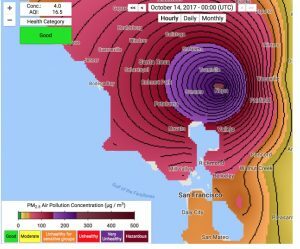 In fact, at the time of writing, the pollution is actually better in Sonoma and Napa than it is in my hometown of Berkeley. Early this morning the air pollution in Berkeley was just “moderate” (like smoking one cigarette per day). Thankfully, my kids school has made the sensible decision of cancelling all outdoor activities for the whole week, and keeping the kids indoors. They have also cancelled the planned celebration of “Fall Fest” for this Sunday. While the air pollution may not be as deadly as the raging fires, it is worth taking steps to minimize your family’s exposure. 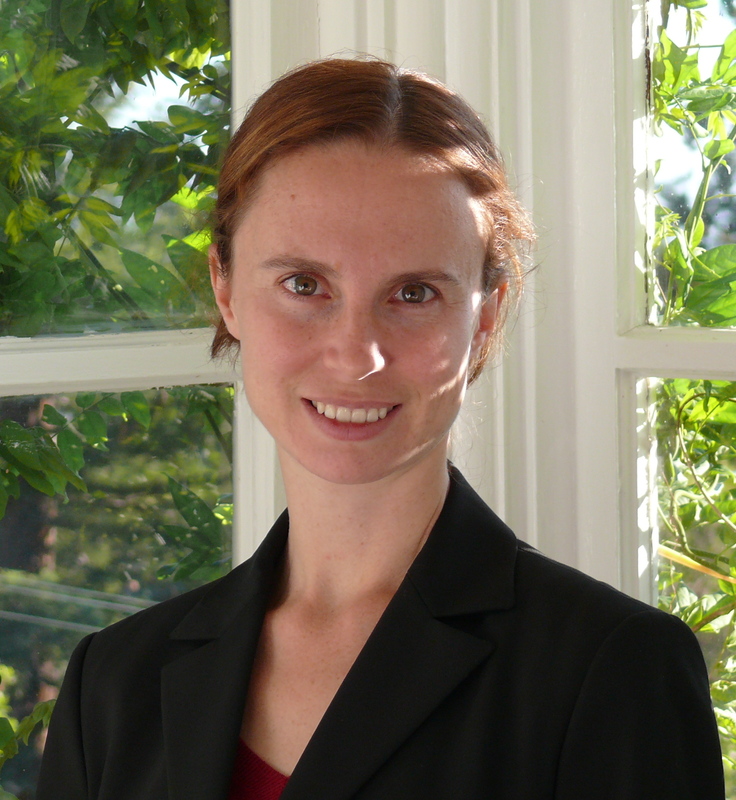 Elizabeth Muller is the co-founder and Executive Director of Berkeley Earth, a non-profit research organization. Elizabeth guided the strategic development of Berkeley Earth from global warming data analysis, to climate communications, to global warming mitigation, and now, PM2.5 and global air pollution. Elizabeth has authored numerous scientific and policy papers, as well as Op Eds in the New York Times and the San Francisco Chronicle, and made numerous TV and radio appearances. Prior to co-founding Berkeley Earth, Elizabeth was Director at Gov3 (now CS Transform) and Executive Director of the Gov3 Foundation. From 2000 to 2005 she was a policy advisor at the Organization for Economic Cooperation and Development (OECD). In these positions, she advised governments in over 30 countries, in both the developed and developing world, and has extensive experience with stakeholder engagement and communications, especially with regard to technical issues. 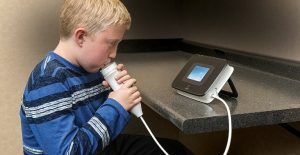 Parents with children who have allergies and asthma are used to checking the pollen count and ozone levels, much in the same way that other parents check the daily weather. These things may impact how they organize their day, and how much time they’ll let their children spend outdoors. But there is another pollutant, less commonly known, that they should be checking too. 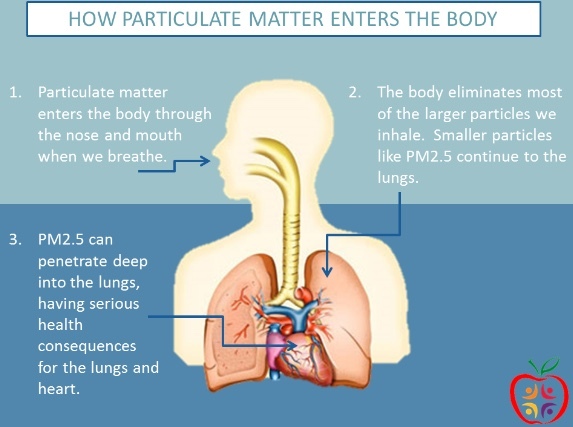 It is called PM 2.5, and is now recognized as the most deadly type of air pollution. PM 2.5 refers to particulate matter 2.5 microns in size and less, and the greatest source is coal, though vehicles, forest fires, and desert dust are also sources. 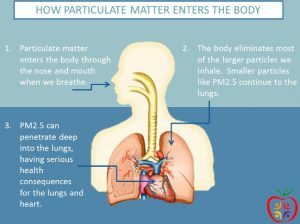 There is a growing body of evidence that PM 2.5 increases the risk of heart attacks, stroke, lung cancer–and asthma. 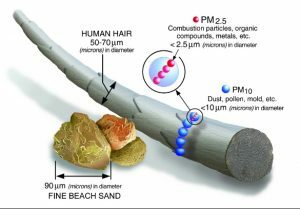 Most Americans still haven’t heard of PM 2.5. The US Environmental Protection Agency (EPA) only started systematically reporting PM 2.5 levels in 1998. The United Nations recently released a report stating that approximately 300 million children around the world breathe highly toxic air. The impact of such air pollution on children is especially bad, since their lungs are still developing. 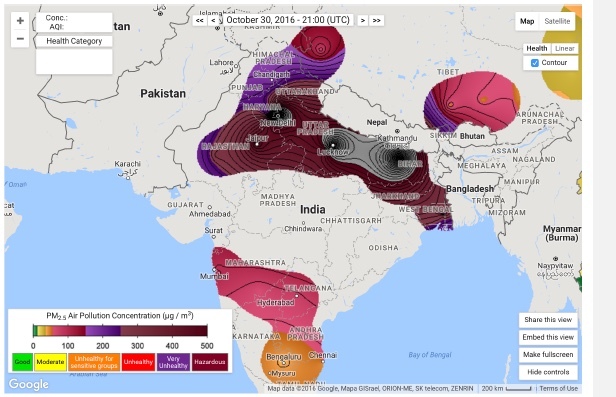 A few days ago, much of India celebrated Diwali, and the impact of the resultant air pollution was catastrophic. The grey areas in the image below show pollution areas that are far worse than “hazardous”, and are actually so bad that they are “off scale” (the light grey areas have no available data). 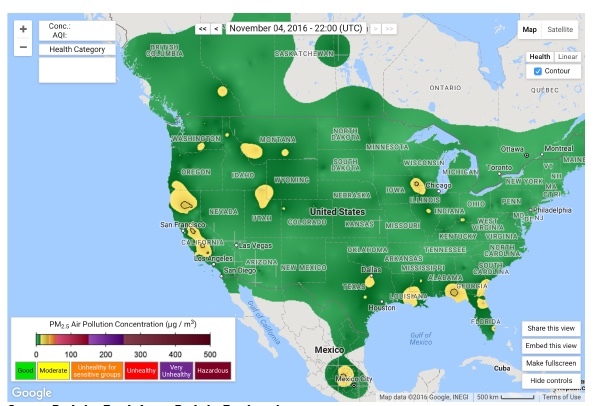 While pollution levels are much better in the United States , and the corresponding map (see below) is mostly green for “good” air, we now know that the levels of PM 2.5 are sufficiently high that the average level of this pollution in the US shortens the average life by about the same amount as smoking a half cigarette per day. While nobody wants their kids smoking half a cigarette per day, asthmatic kids are especially at risk from this regular dose of air pollution. The EPA calculates that the number of deaths in the United States from PM 2.5 is around 75,000 every year, far less than in Europe or Asia, but far more than the number of automobile accident deaths in the United States. We have been studying PM 2.5 at Berkeley Earth, and we obtain a similar number. PM 2.5 is arguably the greatest environmental problem in the world today. air pollution in Europe at the time of writing. It is not nearly as bad as air pollution in India, but still bad enough to kill more than 400,000 people a year, according to the European Environmental Agency. Compare that to less than 100,000 deaths per year for ozone and nitrogen dioxide combined, pollutants that more people are familiar with. The Clean Air Act treats PM 2.5 as a serious pollutant, and is one of the major reasons that power plants are increasingly switching from coal to natural gas. A switch from coal to natural gas reduces PM 2.5 by a factor of 400. Switching from coal to renewables or nuclear power essentially eliminates PM 2.5 from power production. And as with pollen, daily variations can be much worse. National averages camouflage the large regional and seasonal disparities across the United States. The Berkeley Earth website now updates a map every hour showing PM 2.5 levels across the US. 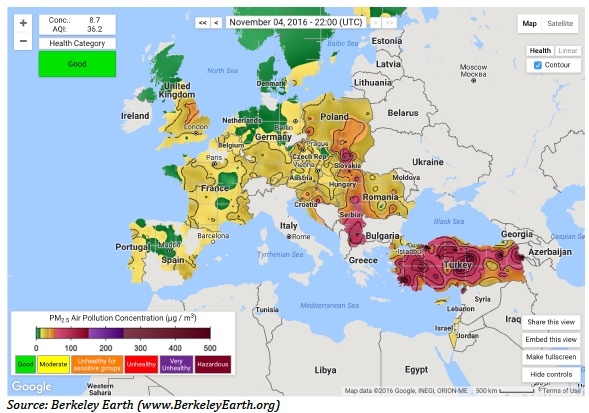 (It is available here: http://berkeleyearth.org/air-quality-real-time-map/.) We’ve been doing this for only a few months, so we do not yet know what patterns are likely to emerge. We do know that in much of the world, PM 2.5 is worse in the winter months – so parents may wish to monitor levels carefully during this time. On bad pollution days in the United States, called “Spare the Air Days”, it is illegal to burn wood, manufactured fire logs, pellets, or any other solid fuels in your fireplace, woodstove, or outdoor fire pit. We are asked to carpool, take public transportation, walk, or ride a bike to work. 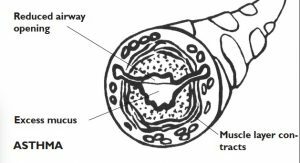 Ironically, walking or riding your bike on such days (or any sort of outdoor exercise) will actually increase your exposure to air pollution, by increasing the amount of air you breathe. A recent paper published by the Columbia University Medical Center shows that active kids are more exposed to pollution, and that the higher pollution exposure may offset some of the benefits of being active. It is certainly not wise for kids or asthmatics to walk or bike to work on bad pollution days. Tomorrow, when you check the pollen and ozone levels, as well as the chance of rain, you might want also to check the local PM 2.5 levels.